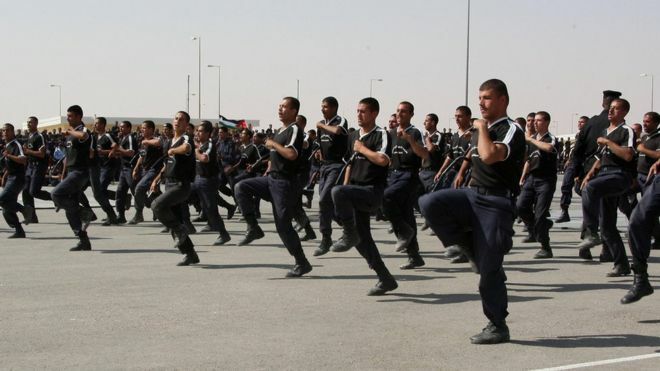 JORDAN: 2 AMERICAN CONTRACTORS SHOT TO DEATH IN AMMAN BY JORDANIAN POLICE OFFICER……. – The Tundra Tabloids……. JORDAN: 2 AMERICAN CONTRACTORS SHOT TO DEATH IN AMMAN BY JORDANIAN POLICE OFFICER……. They’re saying he was “disgruntled”, but disgruntled about what, infidels in general? AMMAN, Jordan — Two American contractors and a South African colleague were gunned down Monday at a U.S.-funded police training center in Jordan, according to officials. Jordan’s embassy in Washington said a Jordanian civilian employee also died in the attack at the facility in eastern Amman. The gunman — a Jordanian police officer — was killed at the scene, according to a statement from the embassy. It added that two American trainers and three Jordanians were injured. Government spokesman Mohammad Momani told NBC News that the attack unfolded in the cafeteria of the training facility and that an investigation was underway into the gunman’s motives. U.S. defense officials told NBC News that the attacker was a disgruntled former cop who’d recently been fired. Previous Post Previous Post HOW TO MANAGE A HOSTILE ANTI-ISRAEL INTERVIEWER: NAFTALI BENNETT VS. HARDTALK’S TIM SEBASTIAN…….